I didn’t really make props for the pilot exclusively from videogame parts, that’s ridiculous. But I did use an XBOX 360 headset and a Nintendo DS “phat.” Not to mention an old Mattel Electronics football handheld and some PlayStation controller cables. Love the characters! Thought it was funny even though I don’t speak the language. So funny, bot! It’s also so adorable! I love the expressions so much. Especially the CornFather sticking out his tongue. Great work, man. And thanks for the pilot plug! Cornfather likes to kick it old school with his references. I only wish we could have seen a real pic of jefbot with the gear on for comparison sake. LOL! PACMAN!!! I was just playing that too. xD Great comic Jeff!!!!! The last panel’s my fave. There’s so much to love: Jefbot glee, Jefbot sass, Jefbot get-up, Cornfather sass, Cornfather body-snub, and Cornfather tongue. I love the old school game boy in the first frame! So funny! I love Pacman!!! Rock on Jefbot, excellent web comic… P. S. I LOVED all of the props. is that a pot leaf on jeff’s mate’s shirt, or a palm tree? 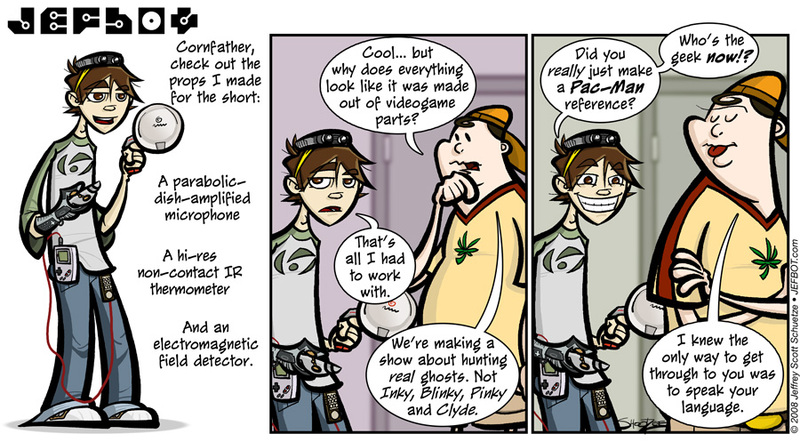 Jefbot’s expression in the last column made my day. You look so unreasonably happy!